Nosgoth, the vampire vs. humans multiplayer romp that’s loosely based on Legacy of Kain has been in closed beta for a while now. While it will be free-to-play, for the time being, you’ve needed to purchase a founders pack to get access. No more! At least, not for the weekend. For four days, from the 7th to the 10th, it’ll be open season on vampires. It starts at 12:00 BST on the 7th, finishing at 8:00 BST on the following Monday. Wondering what to expect? 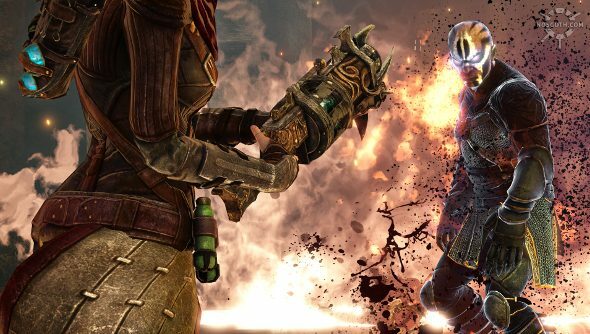 Take a gander at my Nosgoth hands-on preview. Nosgoth forced me to eat my hat. I had low expectations, it coming from the ashes of a Legacy of Kain game that never existed. And then there’s the issue of it not looking like – and mixing up the lore of – the original series. All of that was forgotten after a couple of matches. It’s an asymmetrical game, with vampires able to climb building, leap across gaps and even fly – all in an effort to get in close and kill and then feed on their prey. Humans, on the other hand, are ranged warriors, huddling together in defensible areas, waiting for the next vampire attack. It’s tense and battles are quick and savage. The fights really shine with communication though. Few of the abilities clearly work in tandem at first – a problem Steve had when he had his hands-on experience – but a team that works together well can be extremely effective killers. Reavers can launch smoke grenades to hide their vampiric allies, letting them get closer to their human prey, while the hideous Sentinel can pick up humans, fly off with them, and drop them into a crowd of vamps, ready to feast on their blood. You can find out for yourself if it’s your cup of plasma on Thursday.